I don't claim to understand them, and certainly don't suggest they all think alike. But there are certain recurring themes if you listen to or read the words of those who think Lee should stay. They're worth listening to. They're human. They mean well. They're not crazy. First, let's set aside the arguments we're not trying to understand. True, if the statue is simply moved to a different Charlottesville park, Charlottesville will have to pay, and that money could have gone to creating a new park with monuments to peace and civil rights, etc. Perhaps there are people for whom this really is the central argument. Perhaps they are also consistent in their frugality and put up the same struggle against billion dollar highways and trillion dollar militaries. Perhaps the announcements of how much good could be done for the poor with the money that could be spent to move a statue are being made by some people with a history of caring about the poor. We'll save trying to understand them for another time. Also tangential here is the argument that removing a statue erases history. Surely few of these history fanatics protested when the U.S. military tore down the statue of Saddam Hussein. Wasn't he part of Iraqi history? Hadn't the CIA meant well and gone to great efforts in helping to put him in power? Hadn't a company in Virginia provided him with important materials for making chemical weapons? Good or bad, history shouldn't be torn down and erased! Actually, nobody's saying that. Nobody's valuing any and all history. Few are admitting that ugly parts of history are history at all. People are valuing a particular bit of history. The question is: why? Surely history supporters don't believe that the 99.9% of Charlottesville history not represented in monumental statuary has been erased. Why must this bit of history be monumental? There may be those whose historical concern is simply for the past 90 years or so of the statue being there in the park. Its existence there is the history they are concerned about, perhaps. Perhaps they don't want it changed simply because that's the way it's been. I have some sympathy for that perspective, but it has to be applied selectively. Should we keep a half-built frame of a hotel on the downtown mall because my kids have never known anything else? Was history destroyed by creating the downtown mall in the first place? What I'm interested in trying to understand is not why people want nothing to change. Nobody wants nothing to change. Rather, I want to understand why they don't want this particular thing to change. Here's what I think we should try to understand. Supporters of the Lee statue whom I've spoken with or read or been yelled at by think of themselves as "white." This is important to them. They belong to the white race or the white ethnicity or the white group of people. They don't -- or at least some of them don't -- think of this as a cruel thing. They see many other groups of people engaged in what some 40 years ago was intentionally described by its participants as "identity politics." They see Black History Month and wonder why they cannot have a White History Month. They see affirmative action. They read about calls for reparations. They believe that if other groups are going to identify themselves by superficial visible features, they ought to be allowed to do so too. On Thursday Jason Kessler, a blogger seeking to remove City Councilman Wes Bellamy from office, described the Robert E. Lee statue as being "of ethnic significance to southern whites." No doubt, he thinks, and no doubt he's right, that if there were a statue in Charlottesville of a non-white person or a member of some historically oppressed minority group, a proposal to remove it would be met with cries of outrage at the violation of something of value to a particular group -- any group other than "whites." 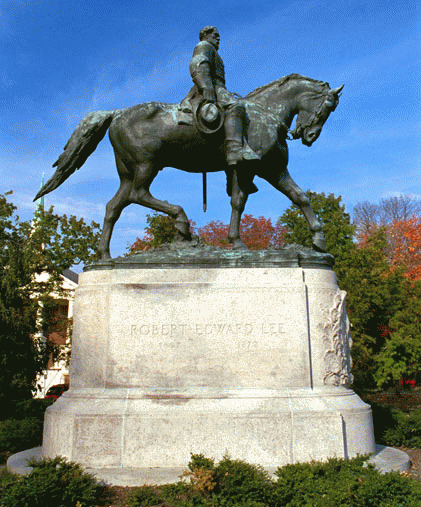 One might ask Mr. Kessler to consider the significance of the fact that there actually are no statues of non-white people in Charlottesville, unless you count Sacagawea kneeling like a dog beside Lewis and Clark. Or you might ask how his condemnations of political correctness fit with his denunciation of Wes Bellamy for old comments hateful toward gays and women. But what I'm asking you to ask, instead, is whether you can sense where Kessler or the people who read his blog may be coming from. They denounce "the double standards" that they perceive all around them. Whether you think those standards don't exist, or think they're justified, it is clear that a lot of people do think they exist and are convinced they are not justified. One of my professors when I was at UVA many years ago penned some thoughts that were widely cited a couple of months ago as having been a prediction of Donald Trump. This professor, Richard Rorty, asked why struggling white people seemed to be the one group liberal academics didn't care about. Why is there no trailer park studies department, he asked. Everyone thought that was funny, then and now. But an anything else studies department -- any race, ethnicity, or other identity, except white -- is very serious and solemn. Surely ending bigotry of all sorts is a good thing, he seemed to say, but meanwhile a handful of billionaires are gathering up most of the wealth of this country and the world, while most everybody else is struggling, and somehow it's acceptable to make fun of accents or teeth as long as it's white people you're mocking. So long as liberals focus on identity politics to the exclusion of policies that benefit everyone, the door will be open to a white supremacist strongman offering solutions, credible or otherwise. Thus opined Rorty long ago. Kessler may see a bit more injustice out there than actually exists. He thinks that radical Islamic, mentally disturbed U.S. veterans are neglected until they engage in shooting sprees because of fear of political correctness. I highly doubt it. I've never heard of many mentally disturbed veterans who weren't neglected. A tiny percentage have any interest in radical Islam, and it is exclusively those, who seem to end up on Kessler's blog. But his point seems to be that there are non-white people who do horrible things, and that it is frowned on to make cruel generalizations about them -- in a way that it is not always frowned on to make cruel generalizations about white people.